• Performance enhancing Dynamic Stability System (DSS) sliding foil • DSS foil reduces heel and pitching = more comfort • Powerful diesel electric drive train and generating system • Reduction in reliance on hydraulics • Improved serviceability • Self-sustaining power generation while sailing • Easy to handle performance sail plan for short-handed crew • New quadrilateral headsail being considered • Ten hours silent mode with all hotel requirements • Six hours predicted generator run per 24 hours One of the most advanced high performance super-sailing yachts ever built is under construction at Baltic Yachts in Finland and is on schedule for delivery in 2019. The design team has invested considerable resource into ensuring the foil is reliable in operation and is completely safe in all conditions. The foil will be moved using an electric captive winch positioned at deck level. Baltic Yachts is co-ordinating the design and engineering team including naval architects Farr Yacht Design in the USA, composite experts Gurit in the UK, Infiniti Yachts, who developed the DSS technology and ISOTOP Composite in France, who are building the carbon/foam foil. Other features include a square-top mainsail, an automated running backstay system and two underdeck sail storage drums, one for a Code sail, the other for the staysail. Dutch carbon spar specialist Rondal is providing the mast and rig package. The 9m long Dynamic Stability System foil runs beneath the owner’s cabin just aft of amidships using America’s Cup technology to deploy it. North Sails is studying an innovative quadrilateral headsail designed with two clews. Its reduced girth measurement in turn reduces drag and the upper clew provides greater trim control. Farr Yacht Design, whose president Patrick Shaughnessy is heading up the naval architecture team, has drawn a yacht with a straight stem and subtly aggressive lines. The Baltic 142 Custom is relatively narrow in the beam, suggesting a fast yacht. With additional stability provided by the DSS sliding foil, ballast weight can be reduced to further enhance performance. She is designed with twin rudders for better handling and to take full advantage of the lifting keel in the up position. Britton Ward, Farr Yacht Design’s vice president who is also working on the project said: “The predicted performance numbers are remarkable with the boat able to comfortably achieve boat speeds equal to the wind speed in moderate to strong winds when reaching.” The Baltic 142 Custom’s extensive, luxury accommodation for the owner and six guests in four cabins has been styled by Lucio Micheletti who, in conjunction with Farr Yacht Design, is also responsible for the outboard look and deck styling including the unusually long, solid bimini which extends over the cockpit. With powered windows, which lower at the touch of a button the cockpit provides an inside-out environment with natural airflow and complete sun protection. 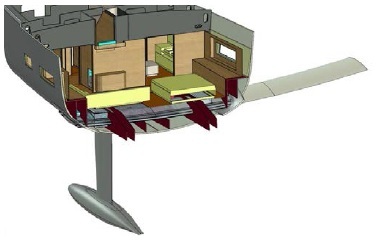 The focal point of the accommodation will be the vast deck saloon with panoramic views outboard and direct access into the cockpit areas. The Baltic 142 Custom, commissioned by an experienced yachtsman who is a repeat client for Baltic, is also breaking new ground for the company with her diesel electric propulsion system which reduces fossil fuel consumption and is considerably quieter than conventional systems. Because of its high voltage capacity the system can drive equipment like the bow thruster, the rotating stern drive leg and captive winches, reducing the amount of heavy, space hungry hydraulics. Under power, the Baltic 142 Custom will be driven not by a conventional internal combustion engine, but by a magnet motor directly connected to the propeller leg protruding beneath the hull. A permanent magnet motor uses magnets instead of wound copper bushes and is much more efficient. Because of its small physical size, compared to an induction motor, and high power output, it needs to be water-cooled. Kim Kolam, responsible for the 142’s diesel electric system said: “The propulsion motor will be powered by six banks of lithium ion batteries which in turn will be charged by two generators. Between them they can produce 420kW, enough to propel the yacht at full power and run all hotel and sail handling requirements simultaneously.” He said that in quiet ship mode – using battery power only while underway – the yacht could run for about six hours at half speed. To make a system like this possible it operates on what is known as a mid-voltage level of 700volts so that equipment can be run electrically rather than hydraulically. Other advantages include a saving in weight due to smaller cable sizes and reduced noise and vibration. 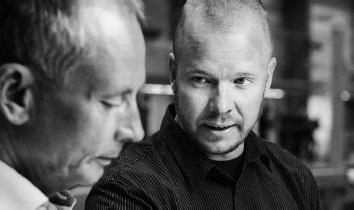 In a further move to reduce unscheduled maintenance, the assembly of the diesel electric propulsion system has been contracted out to Visedo, a specialist company headquartered in Finland with a global service network. The Cummins diesel engine element can be serviced almost anywhere in the world and the electric motor or permanent magnet motors and their control systems have been well tried in other fields. 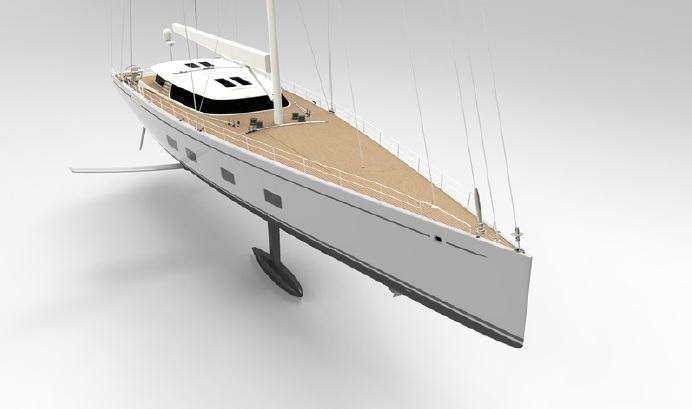 The Baltic 142 Custom is on schedule for delivery in less than two years.